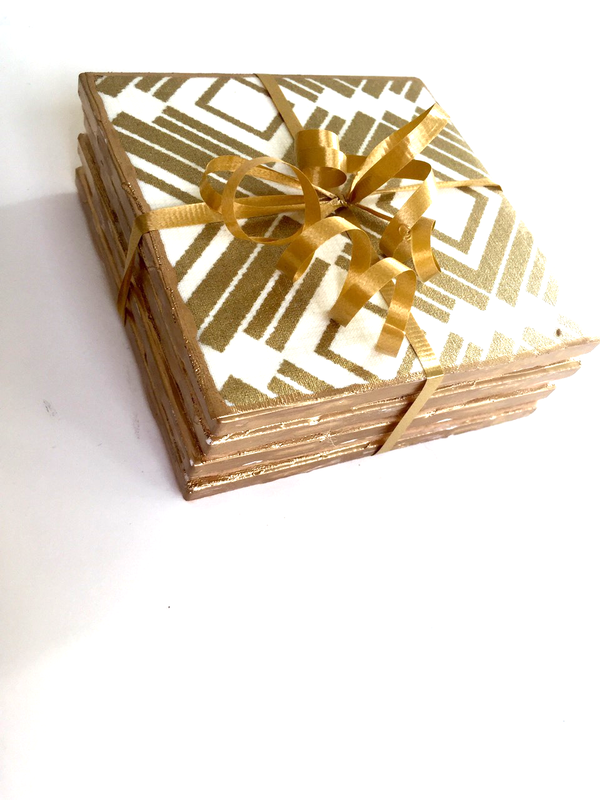 Coasters are the perfect hostess gift. It’s something that everybody needs but rarely buy for themselves. Unless of course, you travel a lot and bring them back as souvenirs. Today I will show you how to make some glamorous coasters that any hostess would love to receive. You can use your fabric scraps for this as it requires very little material. Apply a coat of Mod Podge on the tile. I brought my tiles from The Home Depot for about 16 cents each. Cut a 4″ square piece of desired fabric and place it on top of the tile. I found my fabric at Walmart. By the way,Walmart now carries pre-cut quarter bundles in an array of colors and designs. This gold bundle screamed New Year and I think I heard it call my name too !! By the time I reached the checkout register, I’d already planned my next blog post. Now, if only I could come up with what to cook everyday this fast! Next, apply a generous coat of Mod Podge on top of the fabric to seal it. Don’t worry how it looks. It will dry clear. Take a thin paint brush and apply the Liquid Gold Gilding to the outer edge as shown below. This gives your ordinary coasters the WOW factor! I simply love it! You can easily substitute the liquid gilding with gold acrylic paint. I also made a thin border all around the fabric edge. I think this step gives the coasters a finished look, what do you think? To keep the tile from scratching the furniture, I used a 4″ scrap of felt and glued it to the bottom of all four coasters. You can also use the felt pads here. I’ve made my share of tile coasters before, but these by far are my favorite. Once your hostess receives these, I guarantee they will not end up in the re-gifting pile! I personally like the mix and match coasters, but if you want to use one pattern only, then go for it! Since each of my pattern was a quarter yard, I have a lot of fabric leftover. If you have any suggestions on what I should use it for, please comment below. Wishing everyone a very happy 2016! !